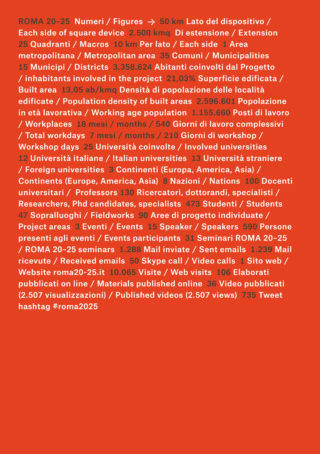 Twentyfive universities and faculties of architecture, from all over the world, twentyfive different projects, a lot of professors and students, one exhibition. 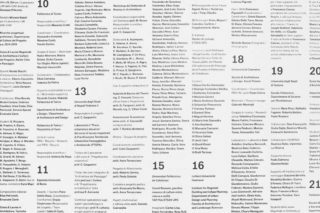 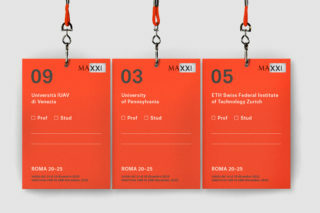 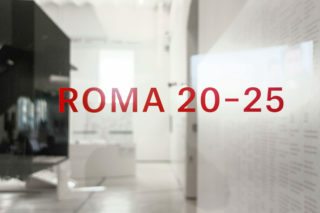 MAXXI — Museo nazionale delle arti del XXI secolo in collaboration with Assessorato alla Trasformazione Urbana organized the exhibition Roma 20–25. 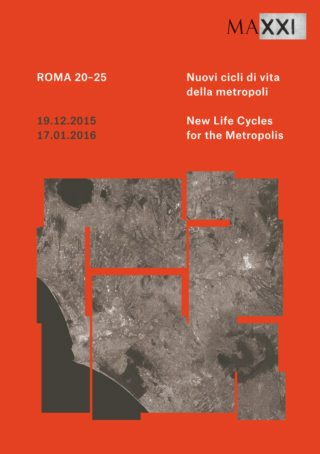 New Life Cycles for the Metropolis, reinterpreting the historical and original exhibition Roma interrotta by Piero Sartogo (Mercati di Traiano, Rome, 1978) in which — starting from the Giambattista Nolli’s plan of the Eternal City — twelve architects (Costantino Dardi, Romaldo Giurgola, Michael Graves, Antoine Grumbach, Leon Krier, Robert Krier, Paolo Portoghesi, Aldo Rossi, James Stirling, Colin Rowe, Piero Sartogo and Robert Venturi) were called to imagine a vision of an impossible Rome. 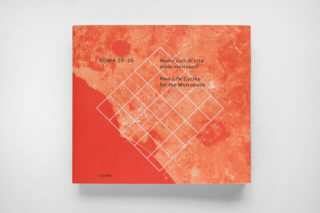 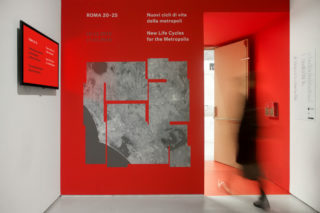 In the same way the purpose of the MAXXI’s exhibition was to show the results of Roma 20–25, a project that had the aim to reopen a reflection about Rome and in general on the contemporary metropolis, in which each working group, has conceived and designed new scenarios for the city. 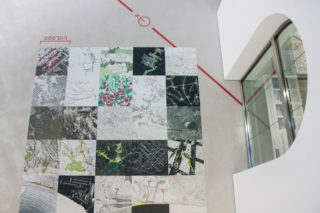 The entire (huge) area covered by the project, 50 x 50 km, was divided in twentyfive areas, organized in a grid of 5 x 5 modules. 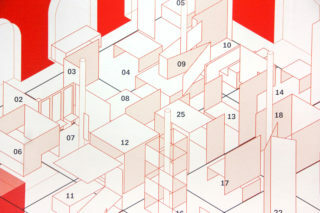 Each area was assigned to an university. 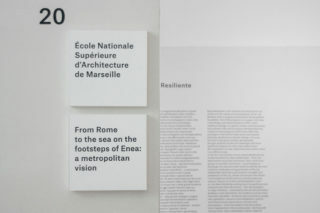 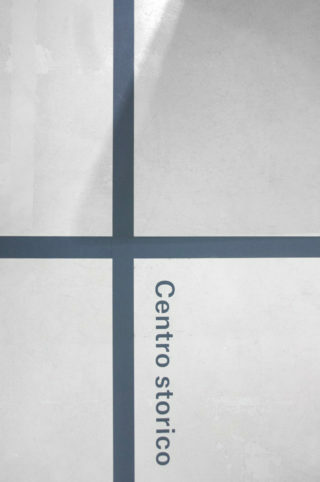 The starting ideas were to reproduce this grid inside the exhibition space, a squared plan hall of the Museum, and to give the possibility to each university to design his own exhibition. 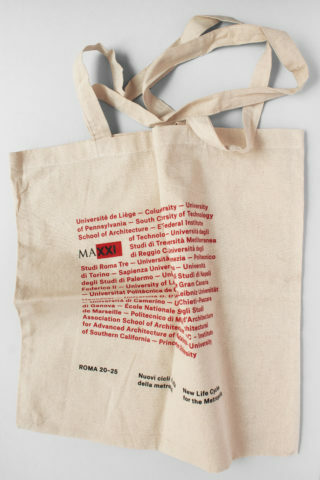 This approach could have produced an uncontrollable heterogeneity but, for this reason, in according with the Museum we designed a sort of guidelines, with some specific aspects that each group had to respect (maximum size, colour etc.). 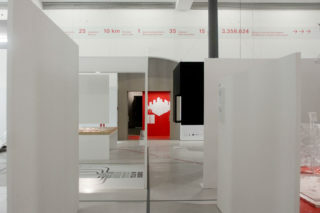 The two fundamental aims of the discussion about the project were how we could comunicate to the visitors, in a correct way, the scale of the project and how we could guide the visitors inside this complex space. 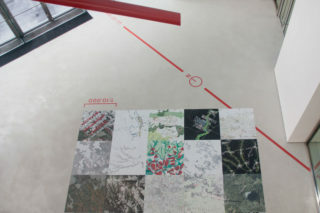 We decided to work on the ground of the gallery so we reproduced the whole grid of the project’s area with a floor signage. 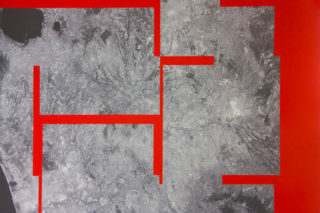 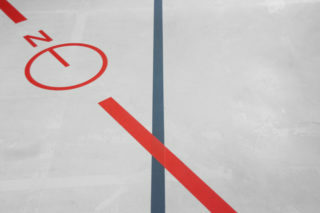 We integrated a red sign, a sort of sundial, that suggested the North to the visitors. 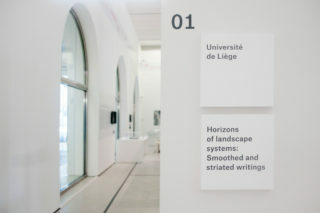 In addition to these we used a very simple vertical signage system with the name of the projects and universities. 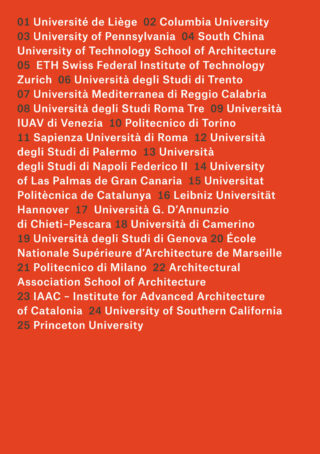 The universities involved in the project Roma 20–25 are Université de Liège Faculté d’Architecture, Columbia University, University of Pennsylvania, South China University of Technolgy, Eidgenössische Technische Hochschule ETH Zürich, Università degli Studi di Trento, Università degli Studi Mediterranea di Reggio Calabria, Università degli Studi Roma Tre, Università Iuav di Venezia, Politecnico di Torino, Sapienza Università di Roma, Università degli Studi di Palermo, Università degli Studi di Napoli Federico II, University of Las Palmas de Gran Canaria, Universitat Politècnica de Catalunya + ESABV, Leibniz Universität Hannover, Università G. d’Annunzio di Chieti-Pescara, Università di Camerino, Università degli Studi di Genova, École Nationale Supérieure d’Architecture de Marseille, Politecnico di Milano, Architectural Association School of Architecture, London, Institute for Advanced Architecture of Catalonia, University of Southern California , Princeton University.